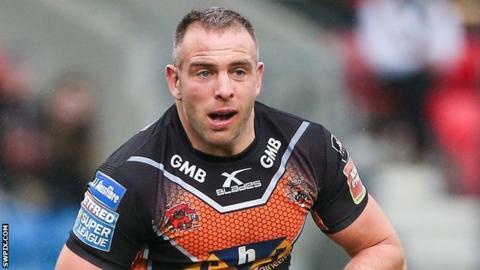 Castleford Tigers prop Andy Lynch will retire at the end of the 2017 Super League season, ending an 18-year professional career. Lynch, 37, is in line to make his 500th career appearance when the Tigers face Warrington on Sunday. Only former England skipper Kevin Sinfield has made more appearances in Super League than Lynch, who also had spells at Bradford and Hull FC. "I discussed it a lot with my wife April," Lynch said. "We decided it's the right time for me now to look to the next chapter of my life. My three boys are at that age now where I need to be there more at the weekend, they are all playing sports and I've already missed out on a lot with them. "It's now time to turn the tables and for me to spend my weekend watching my boys play sports." He started and will now finish his career at Castleford, though his most successful spell came with Bradford, where he added Lions honours to his England caps, and also won a World Club Challenge against NRL premiers Wests Tigers in 2006. That stint could be surpassed in his final season with the Castleford Tigers four points clear at the top of Super League with 17 games played, and into the Challenge Cup last eight. "There is still a long way to go for us this season and we will take each game one at a time and work hard to chalk off the wins each week, but to bring a trophy back to this club and this town would mean everything to me," Lynch added. "It's been part of my life since I was 15, I love this club and I will always be a Castleford fan, bringing a trophy home this season would just be a brilliant way to sign off on a career I have truly loved."